When I baked my first peach pie over the summer, I declared that it was one of the best things to ever emerge from our oven. Well, that peach pie now has some serious competition. 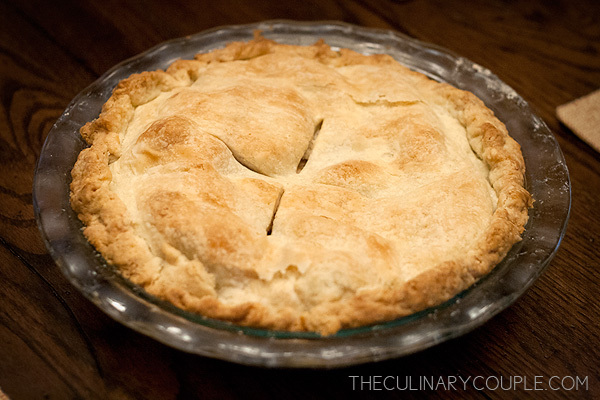 The pie crust is similar to the one that carried the peaches in August, but with less flour and more butter. 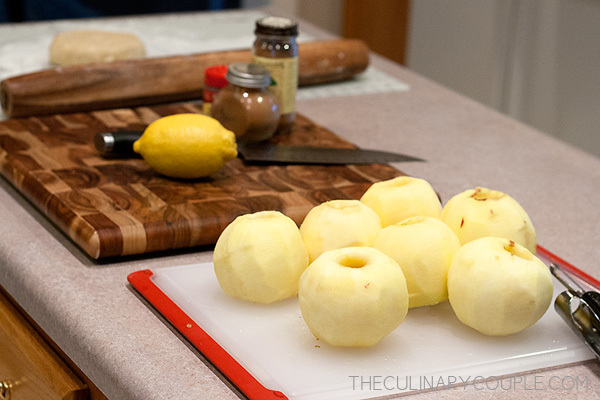 And for the apples, I kept it simple with lemon juice and lemon zest, sugar, and just a bit of nutmeg, cinnamon, and allspice. I don’t believe I rolled the dough as thin as it should have been because I had barely enough to seal in the apples. But no worries. Because when I pulled it out of the oven, it was perfectly flaky and golden. And, yes, of course I had to serve it with a scoop of homemade vanilla bean ice cream. What do you think? Team Peach or Team Apple? Divide dough into 2 balls, and flatten each into a 4-inch disk. Wrap separately in plastic and refrigerate for at least 1 hour, or up to 2 days. Adjust an oven rack to the lowest position, and place a rimmed baking sheet on top of it. Heat oven to 500°F. Remove dough from refrigerator, and let it come to room temperature. Roll one piece of dough onto lightly floured surface to a 12-inch circle. Transfer to 9-inch pie plate by rolling it around the rolling pin and unrolling it over the plate. Gently press dough into plate, and leave leftover dough hanging over the edge. 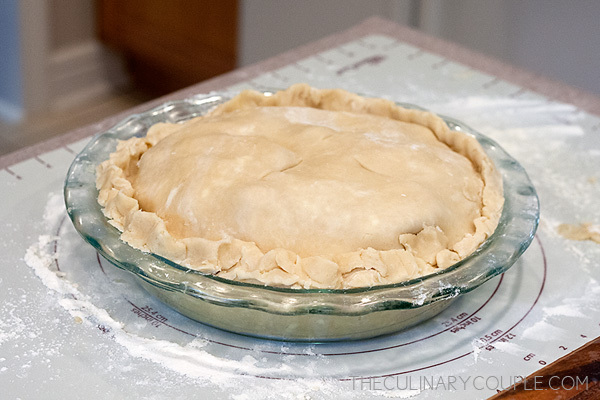 Place dough-lined pie plate in the refrigerator. 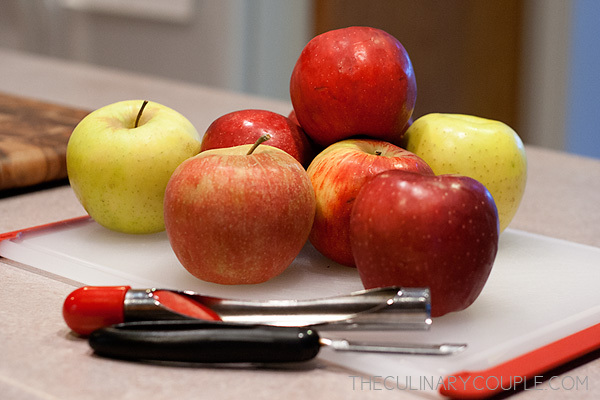 Peel, core, and quarter the apples, then cut them into 1/4-inch slices. Toss with lemon juice and lemon zest. In a separate bowl, combine 3/4 cup sugar, flour, spices, and salt. 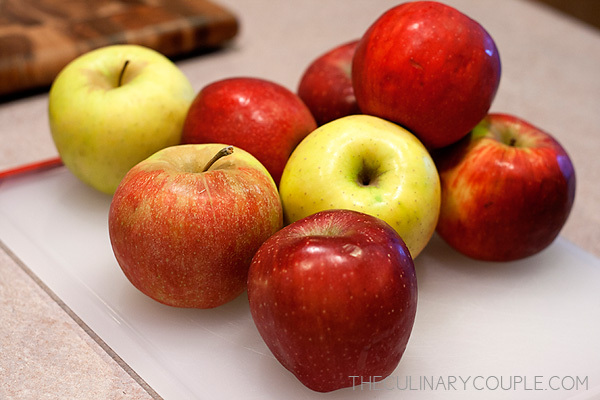 Add dry ingredients to apples and toss. 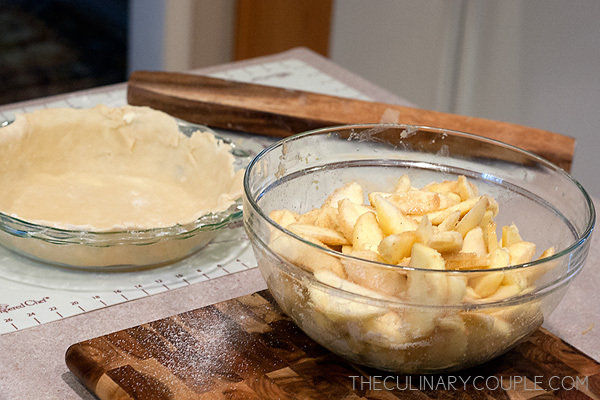 Turn apple mixture, including juices, into chilled pie dough and mound slightly in the center. Roll out second piece of dough to a 12-inch circle, then place it over the filling. Trim edges of top and bottom layers to 1/2 inch beyond the plate. Tuck the dough under itself, and flute the edges to seal it. Cut four slits into the top. (If the dough is very soft, place it in the freezer for 10 minutes.) Brush egg white on top and sprinkle with remaining 1 Tbsp sugar. Place pie on the baking sheet, and lower oven temperature to 425°. Bake until the top crust is golden, about 25 minutes. Rotate pie from front to back, and reduce oven temperature to 375°. 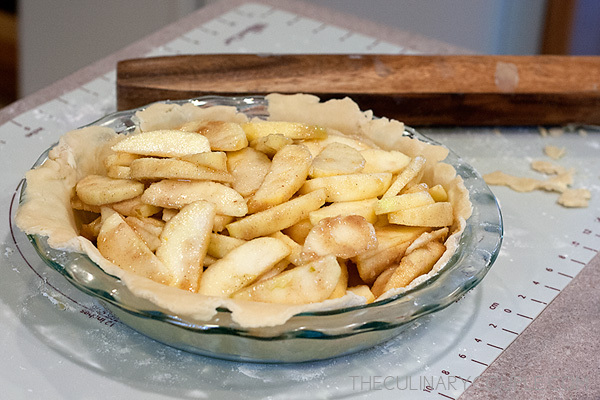 Continue baking until juices bubble and crust is deep golden brown, about 30 minutes longer. Transfer pie to wire rack, and cool to room temperature, at least 4 hours. Serve with vanilla ice cream. 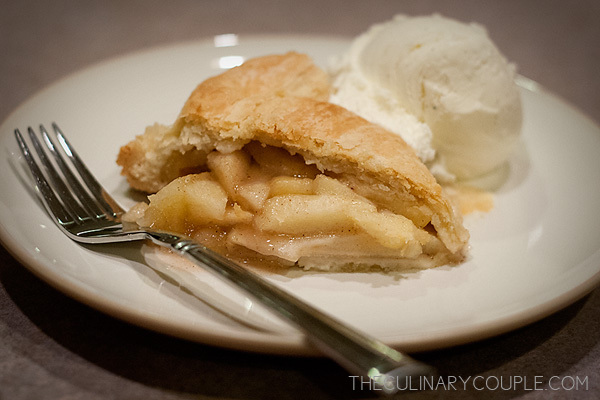 Apple Pie a la mode may very well be my favorite thing of all time. I had it for my birthday cake one year, and my birthday is in the middle of the summer! I am not a very big fan of apples, but I do indeed enjoy eveything baked with apples. I usually make apple crumble at least once a week in the fall… That cookbook of yours seems to be a great one – I just checked the German amazon homepage and unfortunately it is not available over here… 🙁 However, I join team apple and will be sure to try the recipe soon! Happy fall!! !